Knowing all the scoliosis treatments that are available to you will help you make an informed decision. Before a scoliosis treatment can be determined, a full clinical review of the patient by a qualified health professional will need to be completed. Recommendations for scoliosis treatment will depend on the age, severity of the curve, and other underlining issues. Each classification of scoliosis will have its own set of scoliosis treatment options. The following information is a general overview and any scoliosis treatments should always be discussed with your health care professional before beginning. The first treatment option is termed “watch and see” or an observation period. Technically, this isn’t really a treatment at all, it is a hope that the body may make a correction on its own. Interestingly, there are no reported scoliosis cases that have improved by observation alone. More importantly, if there is ever a time to intervene – this would be the time. Rigid bracing was used in the past to prevent the worsening of the curve. These braces are made from a hard plastic, like the Boston brace or Jewett brace. A dramatically different type of brace is the SpineCor soft brace that can not only stop the progression of the curve, but it has shown to correct the curve in children. It can also stop the curve progression and provide pain relief in adults. Another scoliosis treatment is exercise in all of its forms. The back muscles need to be strong to help prevent the spine from continuing to curve. It is important to stretch and strengthen the correct sides of the scoliosis curvatures. 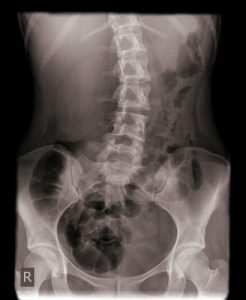 Yoga for scoliosis is an option because of the yoga postures and breathing techniques will help strengthen the body. Pilates for scoliosis is another option similar to the benefits of yoga. The Schroth Method was developed by Katharina Schroth in Germany and is a set of specific exercises used to strengthen certain muscles and help loosen others that have become tight due to compensation patterns. The Schroth method is an effective and evidence-based technique. Additionally, there are certain types of physical therapies such as RPG, SEAS and Vojta, to name a few, that have helped patients with scoliosis. Corrective chiropractic scoliosis treatment can be used in conjunction with all other scoliosis treatments. There is certain corrective chiropractic techniques that can help stabilize and decrease curvatures in both children and adults. Chiropractic is especially helpful in adults who have developed scoliosis from an underlying condition like degenerative spinal disease or developed functional scoliosis. A chiropractor can work with you to develop a scoliosis treatment that help correct some of these conditions and provide pain relief from the scoliosis. Surgery is the final treatment that can be used in severe cases of scoliosis. Surgery may be used to alleviate pain, deformity or if the heart and lungs function is becoming compromised. Scoliosis surgery involves fusing the vertebrae together with metal rods and screws. Choosing the right scoliosis treatment is a difficult decision, so taking your time to know all the treatment options that are available will help you in making right the decision for you or your child. Remember to discuss these treatment options with your health care provider.